The recommendation was made as the Robert Gordon University (RGU) revealed it handed its former boss, Ferdinand von Prondzynski, a termination payment of £237,000 when he left amid a storm of controversy this year. The plan to improve transparency was detailed yesterday in the findings of a joint “lessons learned review” carried out by RGU and the Scottish Funding Council (SFC) in the wake of the recent cronyism row at the institution. And RGU itself has been urged in the report to tighten-up its procedures for dealing with allegations from whistleblowers relating to senior staff. 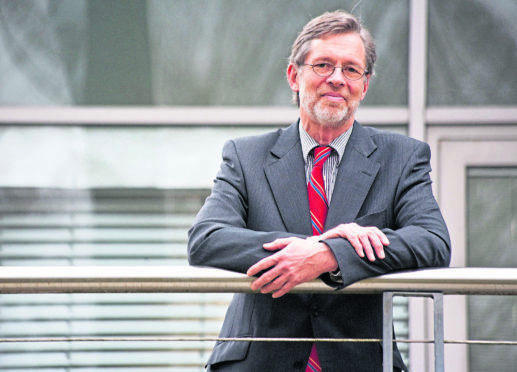 Prof von Prondzynski quit as RGU principal in August after the university’s board heard there was “considerable concern among a broad spectrum of university employees” about the handling of an internal inquiry into his business links with the university’s vice-principal, Gordon McConnell. The former Dublin City University colleagues were co-directors of a firm which owned a £12million castle in Ireland, but the connection was not declared during Prof McConnell’s recruitment. After an internal investigation, the university’s board concluded the failure to declare the link was a “genuine omission or oversight”, but the decision not to sanction the pair prompted another vice-principal, Prof Paul Hagan, to resign in protest. The review, published yesterday, found that RGU’s recruitment policy was “consistent with good practice”, that the board followed “appropriate” procedures when a whistleblower first raised the allegations in May, and that the internal investigation panel acted with “objectivity and rigour”. However, it also suggested that “more tailored guidance” should be put in place in future for dealing with anonymous allegations against senior staff. RGU revealed yesterday that Prof von Prondzynski’s termination pay-off was £237,716, comprised of a “contractual notice payment” of £154,802 and a “non-contractual compensation for loss of office” payment of £82,914. The report said there was a “debate” over whether such figures should remain confidential, but recommended that Scottish universities consider a requirement to publish them “as soon as possible after the date of the settlement agreement”, rather than wait for the publication of annual accounts. It said that this could be achieved through either a revision to the Scottish Code of Good Higher Education Governance or through creation of associated guidance, and also recommended the creation of a new “template” for such pay-off agreements. The probe also concluded that Prof von Prondzynski’s pay-off was “compliant” with the rules, but found that alternative options were “not documented” by the university, and urged RGU to tighten up its procedures. The controversial appointment of John Harper to the principal role in the wake of the row was also examined, and it was concluded that RGU initially made a “mistake” by failing to say publicly that he would only be in the job for a two-year, fixed-term period. Mary Senior, the University and College Union’s Scotland official, welcomed a “really positive” recommendation to improve support for boards which have to deal with allegations against senior staff. On the pay-off, she added: “Clearly it’s good to have transparency. I guess what this has done, in terms of acknowledging the package given to Ferdinand von Prondzynski, has really highlighted these astronomical payments. Mike Fleming, chairman of RGU’s board, said that the report “confirms that the board of governors was rigorous” in adhering to policies and procedures, that the institution constantly seek to “identify any areas our approach can be enhanced”, and that RGU would “embrace the recommendations set out in today’s report”. SFC chief operating officer Martin Fairbairn said the review had put forward “important points for consideration” and the Scottish Government agency would be “looking to universities to incorporate these into future good practice”. The raft of new governance rules for Scottish universities were proposed yesterday following a “chain of events” which rocked the Robert Gordon University this year. It began on May 9 when an anonymous whistleblower sent a “package of papers””to senior figures at RGU listing “allegations of impropriety”. A week later, The Press and Journal revealed that an internal investigation had been launched at the university over claims that its principal, Ferdinand von Prondzynski, had not declared his business link to Gordon McConnell when he was made vice-principal. It was known throughout the appointment process that the pair previously worked together at Dublin City University, but neither mentioned that they were co-directors of Knockdrin Estates Ltd – a firm which owned the £12million castle in Ireland which was the principal’s family home. On July 16, a special RGU board meeting convened to discuss the internal probe’s finding that the two men breached the university’s conflict of interest policy by failing to declare the connection, but that it was a “genuine omission or oversight”. One week later, however, the P&J revealed that RGU had been plunged into fresh turmoil after another of its vice-principals, Paul Hagan, quit in protest at the “extraordinary” decision not to punish Prof von Prondzynski. On August 9, RGU announced that Prof von Prondzynski would be stepping down and would be replaced by deputy principal Professor John Harper. But the decision sparked a furious response from The University and College Union, which claimed the appointment breached good governance codes and smacked of a “jobs for the boys” attitude. It was later clarified that Prof Harper would only be in post for two years. RGU initially refused to discuss the terms of any pay-off for Prof von Prondzynski, insisting it was “confidential”. On September 19, the Scottish Funding Council and RGU confirmed that they would carry out a “lessons-learned review” into the controversies, and the findings were published yesterday. 1) The university should consider more tailored guidance to make it easier to determine the best approach to anonymous allegations relating to senior staff. 2) In future, the university should ensure that the consideration of options surrounding the terms of pay-offs are recorded in writing. 1) Consideration should be given to universities being required to publish information relating to principal-level settlement agreements, as soon as possible after the date of the settlement agreement. 2) Creation of a template for senior-level settlement agreements which would improve the transparency of such arrangements. 3) The committee should consider what actions governing bodies can take in order to demonstrate, in a timely manner, their commitment to the principles of the Scottish Code of Good Higher Education Governance, even if a departure from full compliance has been necessary. 4) Each university should consider the development of a resilience plan. This moves beyond the scope of a traditional business continuity plan. 5) Development of a confidential mechanism whereby governing bodies can access experienced officer-level and governor support from other institutions. 6) In relation to the previous two recommendations, this should include support and advice regarding communications.